During Sunday’s Chargers-Vikings game, Philip Rivers had a lot to go up against. He had to deal with constant pressure, injured teammates, and unfortunate tipped passes. As a result, Rivers delivered a paltry nine points to fantasy football owners. But it’s possible that his toughest opponent wasn’t the Minnesota Vikings. Perhaps Rivers was the victim of Pacific teams’ familiar foe: time travel. 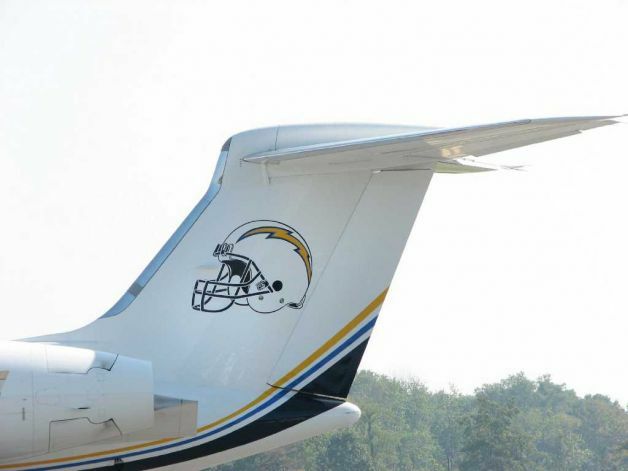 When the Chargers jetted from San Diego to the Twin Cities, they lost two hours, meaning that Sunday’s noon start felt like 10 AM to Rivers and company. 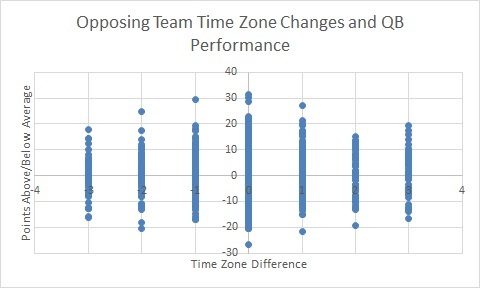 The team effect of traveling across time zones has been the subject of past research, with several studies finding that these time changes do have an effect on performance. But the idea remains less investigated from an individual player (read: fantasy football) standpoint. To test whether time changes affect the output of quarterbacks, I’ve borrowed data from Kurt Bullard, whose terrific post yesterday showed that the strength of the opposing defense is a minor matter for fantasy QBs. The data span the years 2011 to 2014, and only quarterbacks who completed more than four passes in a given week are included. Before creating a model, let’s see if the plot gives us a sense of whether time zone changes have an effect. 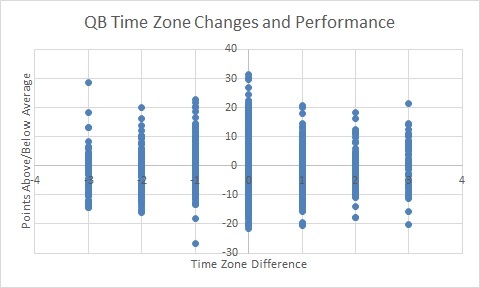 Below is a scatterplot showing the time difference between a quarterback’s native time zone and the game’s time zone (so that 3 means he travelled west-to-east across three time zones), as well as the QB’s performance above or below his seasonal average. If the idea is that travelling across time zones leaves players groggy, we should also expect to see some sort of effect for quarterbacks facing defenses who had to make such trips. Neither plot paints a terribly clear picture, but perhaps the model will. If we regress QB points above/below average against defensive DVOA of opponents, an indicator for away games, and week of the season—all of which were shown to be significant in Kurt’s model—we can see whether time zone travel makes a difference. The results above indicate that there’s not sufficient reason to believe time zone travel affects quarterbacks from a fantasy perspective. The effect of the QB travel and opponent travel predictor variables are insignificant in the model. It’s possible that traveling across time zones is detrimental to performance, but only when teams leap from Pacific Time to Eastern Time. To account for this, I’ve created a dummy variable for cases when teams travel forward three hours. When we rerun the model swapping in the indicator variables, there still appears to be no effect which is significant at the .05 level. Surprisingly, the quarterback three-hour travel dummy is almost significantly positive, suggesting that quarterbacks benefit from Pacific-to-Eastern travel. The methodology used here is far from conclusive. It’s possible, for instance, that this period included an inherent difference in ability between defenses from the Pacific and Eastern time zones. If defenses from the west are better at shutting down quarterbacks than their eastern counterparts, then we wouldn’t expect west-to-east travel to turn up negative in our model; we would expect east-to-west travel to be more detrimental. More importantly, the games in the dataset weren’t limited to 10 AM Pacific start times. The marginal grogginess is much higher for early games than primetime games, so perhaps there is a significant effect that only turns up for games starting at 10 AM Pacific Time. In football, as in science fiction, time travel remains a great mystery. But one thing is certain: if you started Philip Rivers against the Vikings, Sunday was not your day. Night games are the ones you want to check. West coasters should have an edge when visiting East coast teams for 9pm starts. The home team had to play at a high level until midnight, while the road team only plays until 9pm in its home time zone.